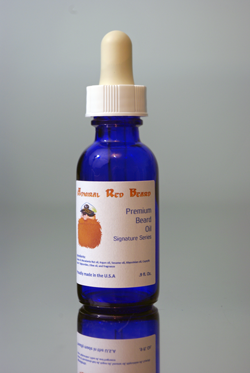 Our premium beard oil helps restore and maintain the general overall health of your beard. Apply a small amount to the palm of your hand. Place the other palm over the palm that has the oil. Evenly coat both palms with the oil. Scrunch or pat into the beard, focusing on the ends. With your fingertips, complete the process by massaging any remaining oil into the facial skin underneath your beard. Comb the beard to evenly distribute the beard oil application and to set the style. Our Beard Refresh Premium Oil contains oils derived from tree nuts. If you have any allergies to tree nuts, do not purchase this product.